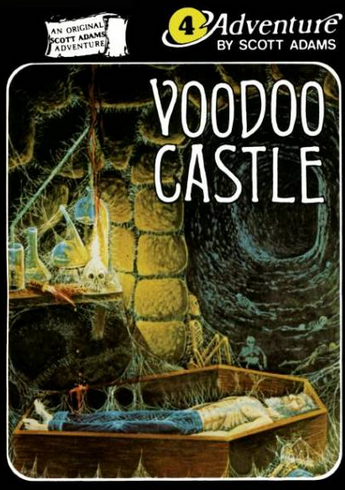 I compared Voodoo Castle earlier to a mystery box, and the analogy seems to be holding up. I’m finding snippets of a ritual for waking Count Cristo, a little at a time. I’m still missing part but I think I might need to just use some guesswork or induction to finish the game. The feeling of peeling back layers of enigma is much stronger as implicit plot than greedily snatching up treasures. Sometimes, writing these things is simply of matter of me playing terrible old things so you don’t have to, extracting design lessons and maybe some interesting quotes. I can gleefully spoil every plot element and puzzle without the feeling like I’m ruining it for everyone. 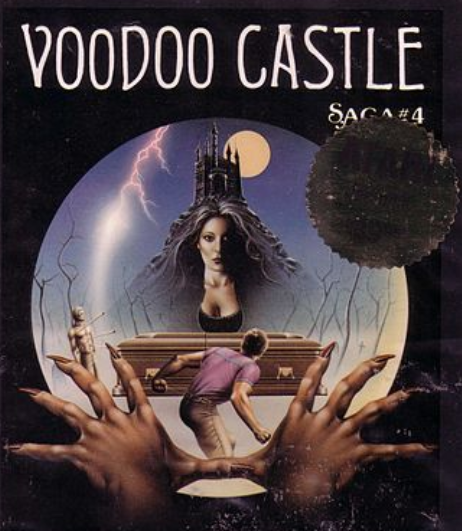 Then there’s games like Voodoo Castle, which are enjoyable enough that I actually want to recommend them. If you feel like you’d have any interest, you might want to just stop reading and go play. To make it easy, here is a link to play online. 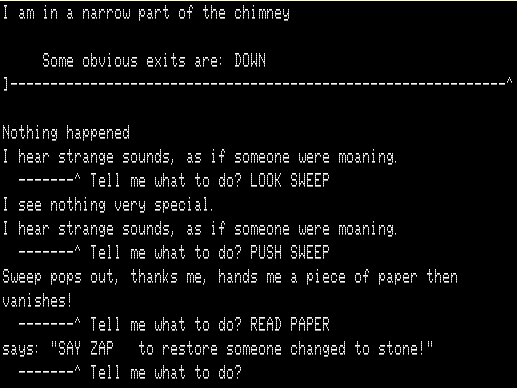 First I had an odd sequence where I found a chimney sweep stuck high in the chimney. There was some anticipation built up for this with moaning sounds which suggest a zombie attack or the like, but it just turned out to be the unlucky guy we rescue in the screenshot below. He gives a paper explaining how the command ZAP turns stone things to life. One ju-ju man statue and a ZAP later, I awoke a ju-ju man in the same room as a ju-ju bag (which I previously could not access because it was “stuck to the floor”) and for some reason this lets us make off with the bag and grab the things within. I think the ju-ju man would be upset, but maybe he’s just thankful we revived him? It’s like the pirate from Pirate Adventure who just wanted to get drunk and didn’t care about what we stole. 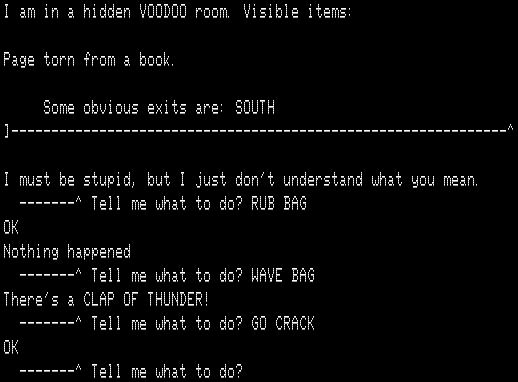 Based on the hint from the medium last time I took the ju-ju bag to a crack that was too tiny to enter (this is different from the tiny door) and did >WAVE BAG, leading me to a secret room. I don’t know if I’m close to the end and I just need to guess the rest of the ritual, or if I still have some things to collect including the final instructions. The only things I haven’t worked with are a.) a shovel, which hasn’t gotten a useful response to DIG anywhere I’ve tried, b.) a kettle of soup and c.) a witch’s brew that turns my character into a broom if I try it. Hopefully this will roll to the finish by the next post? …but rather on the initial screen of the game. These days Scott and Alexis Adams are listed as co-designers. 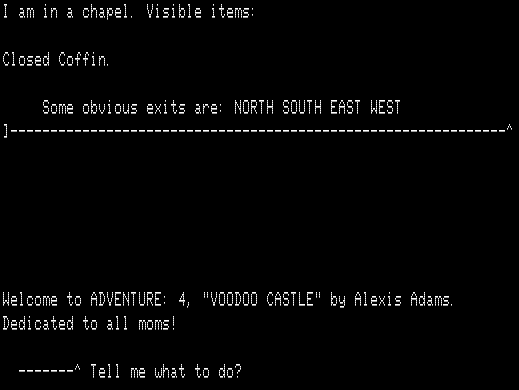 The historian Jimmy Maher mentions that Scott Adams downplayed Alexis’s contribution to the game in later years, but Alexis herself stated she wrote Voodoo Castle on her own, so I’m going to stick with the game’s own credit as solely Alexis Adams. Anyhow! Secret Mission (aka Mission Impossible) broke out of the “find the treasures” mold significantly to give a directed mission that had nothing to do with treasures. Voodoo Castle steps back from the innovation only slightly; the goal here is to wake Count Cristo via some unclear magic ritual. This hence doesn’t feel like a looting expedition with clearly labeled *treasures* but more like solving a mystery box, working out what puzzles to twiddle in sequence to slowly unlock the edges. This is what one of my “maps in progress” looks like. I actually have taken cracks (twice!) at this game in the past, but for some reason never could get any puzzles except for a trivial early one where you WAVE RING to open a door (the game pretty much gives this one away). This time, however, I started making progress. I’d love to know what changed; maybe playing this after a bunch of other late-70s games put me in the right mindset, maybe I’m better at adventure puzzles in general, maybe I was more persistent because I knew I wanted to write about it, or maybe I just got lucky. In any case, some spoilers follow. EXPLODING TEST TUBES: There’s a room with a ju-ju bag, chemicals, and test tubes. 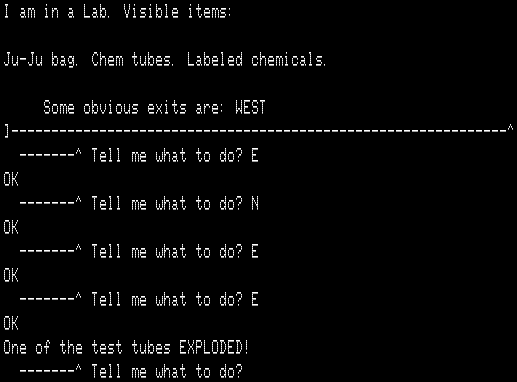 Fairly shortly after entering one of the test tubes explodes, and presuming you have no protection you receive a slightly unfair death / game over. I returned to this room on my second run but somehow the explosions weren’t killing me. I only realized after some experimentation I was being protected by a shield I was carrying since there is no message at all about how I’m managing to survive. This persists even when picking up the exploding tubes and carrying them around; somehow the shield is good enough to protect from a test tube exploding in one’s inventory. 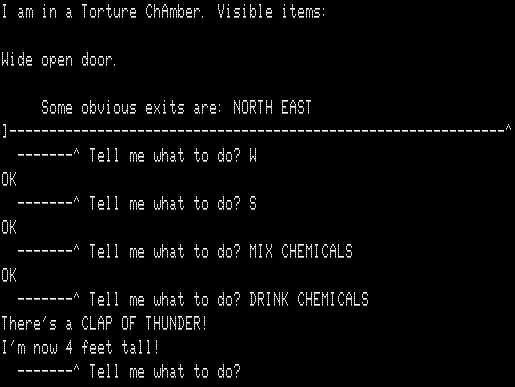 TINY DOOR: In sort of an Alice the Wonderland scenario, the chemicals from the exploding test tube room can be mixed and then drunk to get smaller. Not a lot smaller, just four foot tall. This effect lasts the rest of the game, which is an odd visual image. JAIL CELL: Getting through the tiny door leads to a graveyard with a saw. Taking the saw back to the dungeon, there’s a jail cell that if you enter the door locks behind you. However, SAW DOOR pops open the lock. I am unsure why this would work but not using other similar items (bloody knife, broken sword, hammer) and I am unclear even how to visualize what’s going on here, but I somehow solved this one pretty quickly anyway. 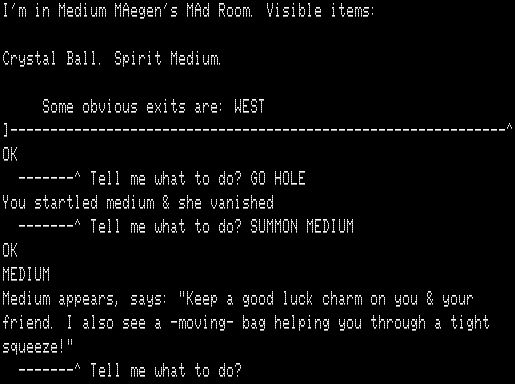 MEDIUM MAEGEN: There’s a pamphlet advertising a medium that can be reached via “SUMMON MEDIUM MAEGEN.” There’s a “medium room” with a crystal ball, but the medium is scared off and disappears. However, if you invoke >SUMMON MEDIUM she comes back and gives some information, the first time the game conveys any concrete way how to complete the main quest. PLAQUE: This was for me the coolest puzzle so far: there’s a plaque with print too tiny to read. If you’re carrying some broken glass you can avoid the tiny print problem by using the glass as a magnifying glass (unlike the shield I thought this might work and intentionally brought the glass over to use it this way) but the letters are also luminescent and too hard to read in light. Hence you have to take the plaque to the only dark room in the game, inside a chimney; finally you can read the plaque which reveals the combination for a safe. Hum, I’m sounding pretty negative, and in the cold rationality of logic the puzzles are only so-so. Somehow I’m having fun anyway. I think the compactness of the game (and complete lack of mazes, at least so far!) makes a nice counterpoint to the sprawling maps I’ve dealt with lately. From Robert Liddil’s Captain 80 Book of Basic Adventures. I have reached a glorious 225 out of 225 points by depositing all the treasures in the area just outside the castle door. This took some searching because this is not the room you start at, nor does it seem like the most logical place to store a treasure, so I had to wander the map a bit and do >DROP OPAL >SCORE >TAKE OPAL in each room until I found the right one. The Knight: I mentioned earlier that the knight is defeated by a shot from a gold pistol. It’s also possible to simply luck out. This is fortunate because the knight can reappear after being defeated, a fact I only found out near the end of my run when I had ditched my gold pistol already to have more room for treasures. The Pirate: The pirate from Adventure makes yet another appearance here and behaves identically: he takes your treasures and stashes them in the maze. However, on my winning run he never appeared. Here’s the relevant line from the source. It is in other words a straight 1 out of 100 chance. Note this is different than original Adventure, where the pirate has a physical location which travels the map and it is very hard not to run into him (which is good since in Adventure the pirate has his own treasure you wouldn’t be able to reach otherwise). Chester the Jester: He’s got a 1 out of 27 chance of appearing. Here’s everything the jester can say. The Sorcerer: For a while I thought I might never meet a Sorcerer in a game called Sorcerer’s Castle, but based on the hint C$(4) from Chester the Jester I took the gold sword to the study/sitting room part of the map and met the sorcerer in the Dungeon. The inside of the castle. Hand-made maps can be fun once in a while. I’ve officially finished the four games listed in this Mad Hatter catalog, so they definitely represent Greg Hassett’s first four games. Of course he was still 12/13 years old at the time, but it’s enough to spot trends. In the case of Journey to the Center of the Earth, it seems like he was determined to write real descriptions for rooms (just like Adventure had) but ran into the TRS-80 memory limit and just found a stopping point and barely added any semblence of puzzles. By Sorcerer’s Castle Mr. Hassett has taken the same minimalist description tack as Scott Adams allowing him to add many more rooms but still not much more puzzles. It’s like he has discovered the freedom of space but doesn’t know what to do with it yet. What’s common between Mr. Hassett’s later three games (House of the Seven Gables, King Tut’s Tomb, and Sorcerer) is randomly appearing characters. Seven Gables had the ghoul, ghost and cat; King Tut had a mummy, and this game had the menagerie listed above. They’ve currently been the only strength and interest (I’m still curious what’s going on with the cat from Seven Gables) and you can see the author slowing adding to a template. When he returns with Voyage to Atlantis we’ll see if he’s developed any further. All the issues from my last post have been smoothed over and I just have to put everything together into a single winning run. Before I do that, I’d like to discuss an issue that cropped up here and elsewhere during this project. On many of these games there is not one canonical version. While Sorcerer’s Castle Adventure was originally for the TRS-80, it’s been ported for C64 (see cover above) and possibly other systems. Even if I focus on just the TRS-80 original, there are three different versions in BASIC. I’ve been playing “sorcast3.bas” from the above website, with the logic it was the latest revision, but I found out that any interaction with the vault crashes the game. “sorcast1.bas” works correctly (although sorcast3.bas was rather more enjoyable in that it didn’t have an inventory limit). There’s another very odd difference you can see by comparing the title screens (sorcast1 on top, sorcast3 on bottom). Poor Mr. Hassett’s name is mispelled in sorcast3.bas (which explains why I was misspelling his name in my last post). The name change, the removed inventory limit, and the vault bug suggest to me that sorcast3 is actually some sort of hacked version as opposed to one of the originals. What about sorcast1 vs. 2? 2 has some strange word wrap in the descriptions which isn’t in the other two versions. This means I’m going to stick with sorcast1. All this makes it irritating when I just want to find the most representative version and play. It can get much worse. The upcoming game Dog Star adventure has 7 TRS-80 versions in BASIC and 1 in binary. 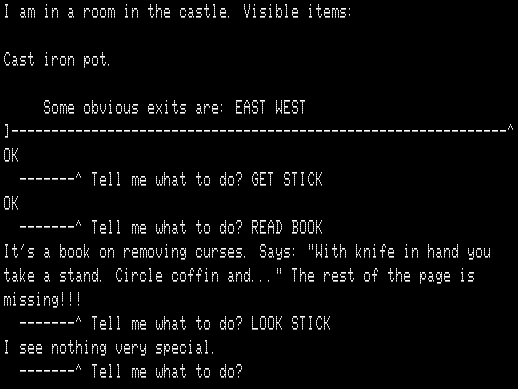 Not much preface or plot: looks like we’re at a castle and just here to rob the guy of his treasures. He’s probably evil. Or we are. Or both. 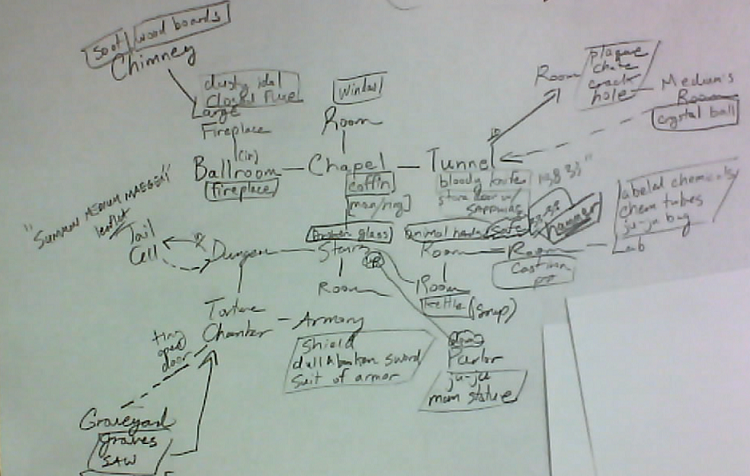 The map above looks fairly logical, but it has just enough trickiness with the endless loops and the turns that I had to map it like a maze; in fact I had to randomly wander until I got out, grab some items, and then use them as a breadcrumb trail to go back and map. But it doesn’t really look like a maze! The layout still forces the player to stall. I’m starting to suspect this at this phase in adventure games mazes were a technique to extend play-time, and when mazes persisted all the way to the late 80s they just became an expectation. I put them in the adventures I wrote when I was a child without thinking. It’s a sort of ritual. Once getting inside the castle, there are two more mazes besides, both of the “twisting maze of little passage” kind. Mr. Hassett’s having a hard time getting over Adventure. What I’ve enjoyed most so far are random appearances by Chester the Jester (seen above) dispensing hints. He reminds me strongly of the jester from Zork Zero. Just that single addition made the game better for me; somehow his presence made the minimally-described rooms feel like a real environment. There’s also a “black knight” who appears quite briefly but is easily shot down by a pistol. I am presuming the sorcerer is somewhere as well. 1.) A vault that I can’t open. 3.) 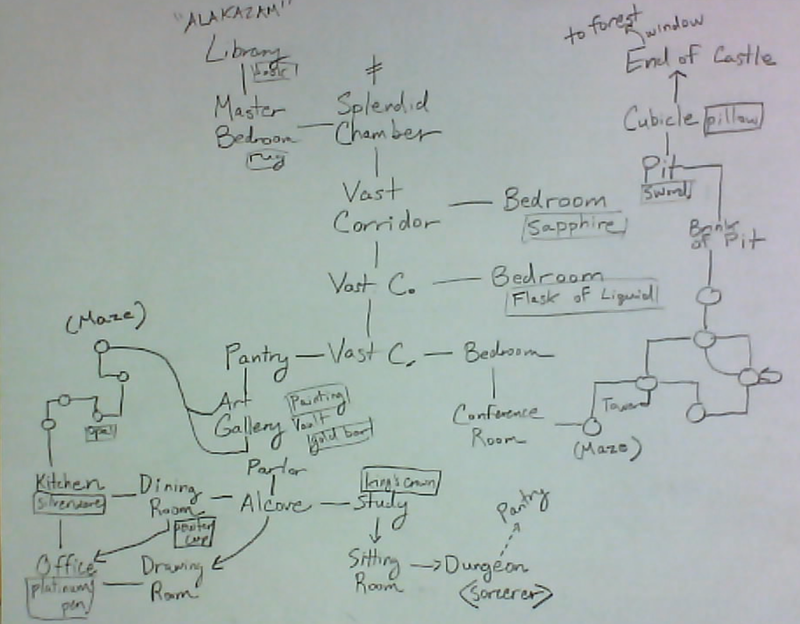 I still have to finish thoroughly mapping one of the mazes. Roger Chaffee’s Quest consists solely of direction commands. There aren’t even any “intermediate treasures” or such: the only objective is to get the pirate’s treasure and get out. There’s a score, but based on the number of rooms visited rather than any kind of treasure count. YOU’RE AT THE HOME OF THE GNOME-KING. FORTUNATELY, HE’S GONE FOR THE DAY. YOU’RE IN XANADU. BELOW YOU ALPH, THE SACRED RIVER RUNS THROUGH CAVERNS MEASURELESS TO MAN, DOWN TO A SUNLESS SEA. YOU’RE IN THE CRYSTAL PALACE. THE WALLS RESONATE WITH AWESOME MUSIC. YOU’RE OUTSIDE THE CAVE. GO SOUTH TO ENTER. YOU’RE LOST IN THE WOODS. I DON’T THINK YOU CAN FIND THE CAVE. YOU’RE NOT A BIRD. YOU CAN’T FLY! I was ready to give up, but: it turns out that this is a maze, you can in fact get to the cave, and taking this weird side detour gives you an extra 6 points. However, since the game never conveys what the maximum possible score is I imagine most people would just miss this entirely. With a possible high score this could have made an easter egg puzzle at least. YOU’RE ON THE LEDGE ABOVE THE GUILLOTINE ROOM. DO YOU WANT TO TAKE IT WITH YOU? OK, LETS GET OUT OF HERE! However, trying to get to the exit results in being blocked because the gnome-king referenced above is no longer gone for the day, and the other possible passage to the exit is too narrow to fit the treasure through. 3. …the pirate of the aforementioned treasure appears. 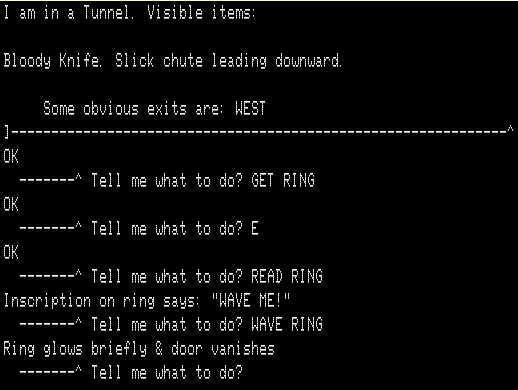 Remembering the Adventure reference, I checked the dead ends in the twisty maze and found the treasure there. After claiming it back the pirate did not reappear. 4. The actual exit was pretty tricky to find. There’s a “labyrinthe” arranged such that any direction other than south loops back to the opening room. Going south four times leads to a “developer room” which teleports you out to a random part of the map. There is an exception in the maze to the “direction other than south” rule, and that’s in the third maze room where going down leads to a chute and the exit. The first time through this series of rooms I figured the pattern continued so I missed the exit. This led to a “hidden in plain sight” type scenario.